Remember Pro Set? They flooded the market with billions of football cards in the late 1980s and early 1990s, making it possible for you to own rookie cards of Barry Sanders, Emmitt Smith and Deion Sanders for pocket change. Many of the company's ventures didn't work, including Guinness World Records cards and a Santa Claus insert. 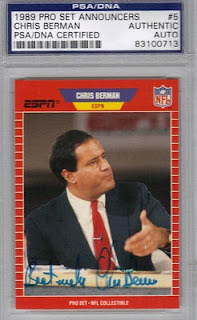 Eventually Pro Set filed for Chapter 7 bankruptcy, and that was it for the inexpensive football cards. But within the failures came one of the greatest - and unintentionally funny - sets of the current collecting era, 1989 Pro Set Announcers. Verne Lundquist - preparing for his greatest glory, a featured role in the Adam Sandler film "Happy Gilmore"
Al Michaels, "Do you believe in moppy hair? YES!" 1989 Pro Set Announcers would be legendary if it featured another dozen cards of broadcast school grads. What makes it world-class is the set's inclusion of players-turned-broadcasters with dubious on-air careers. Ahmad Rashad, whose ex-wife Phylicia starred as Clair Huxtable on "The Cosby Show"
You can find the set online for less than $5. I skipped the 90's, so now have just really discovered the fun of seeking errors and variations in early 90's ProSet football and Topps baseball. In the age where errors are four-digit contrived rarities, it's nice to have a cheap and plentiful alternative. I miss Pro Set. They were fun, with all of their errors, variations & gimmicks. That era was the only time I ever felt any desire to collect football cards. Walsh and Butkus only served in the broadcast booth for a season or two. Butkus replaced Jimmy "The Greek" after he was fired from CBS. 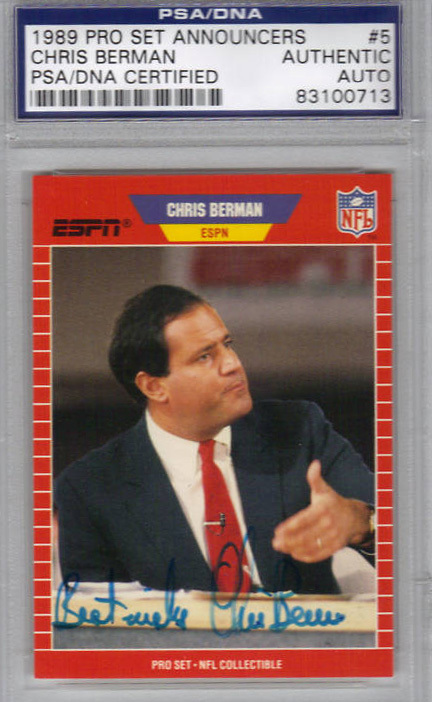 Too bad their's no Joe Buck card, but I realize that he didn't really get started as an announcer until the early 90s, and didn't do football until coincidentally Pro Set died around 1994. If I remember right, Walsh was a studio "analysis" guy. Even with that role, however, he was horrible on television. He was awkward, at best, and scared stiff like an eight-year-old in his first Christmas play at his worst. I think a lot of it has to do with the fact that as a coach, the cameras are there as part of the job he was otherwise focused on delivering. Once the cameras became the job, it just unraveled from there. Add to the fact the difficulty of taking what was certainly a deep, multilayered and professorial analysis and cramming it into six Hee-Haw Terry Bradshaw-grade sound-bite seconds, and that was a recipe for disaster. What is off on this Triple Threads card?